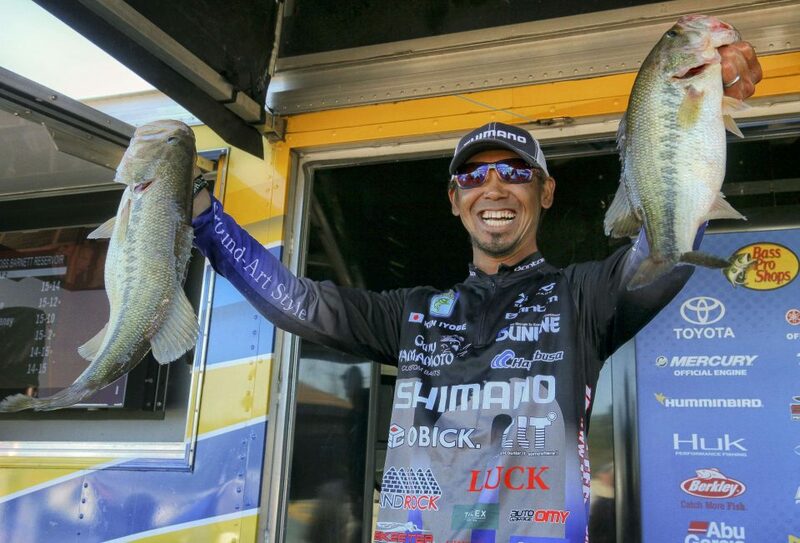 Japanese angler Ken Iyobe made beneficial lure adjustments that today put him in the lead at the Bass Pro Shops Bassmaster Central Open underway on Ross Barnett Reservoir. On Thursday Iyobe chose the tedious approach of flipping a jig to specific, isolated casting targets along the shoreline. Patience paid off with another limit. Today he sped things up with a faster presentation. The idea of covering more water with a crankbait was a good idea. “Today the fish were harder to catch, so I used the reaction lure to cover more water,” said Iyobe, who commutes from the city of Tokoname to compete in American tournaments. Iyobe, who in 2015-16 competed in the Bassmaster Elite Series, used the crankbait in the same areas as Thursday. Fishing the lure slow was key. After covering an area of isolated cover he quickly moved to the next spot using his trolling motor.